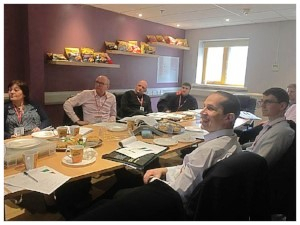 Lauras International were delighted that McCain’s, one of the founding members of the North & Midland Ambassadors Academy, hosted the April meeting at their Site. Peer problem solving was followed by an illuminating factory tour which culminated in group learning on Effective Daily Meetings. Driving improvement within their own workplace is a common goal for all members of The Ambassadors Academy (TAA). Every month the TAA members get together and share best practice, seek peer advice and gain a deeper insight into Lean Sigma FMCG tools. If you are wondering what other manufacturers are doing to improve or are concerned you’re being left behind, then consider becoming an Ambassador? Why not join a group of like-minded individuals who willingly share their experiences? We’ve had the best of our best, which are better than most, working on this for years and they have not achieved these results. This has clearly been a significant breakthrough. The results show this. [2 hours later]... That’s a good idea.